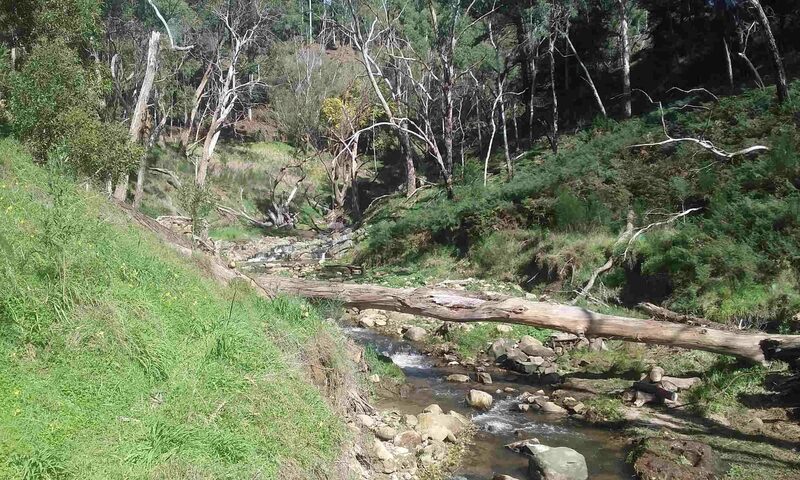 On 25 September 2011 we enjoyed a fantastic conclusion to our series of walks which aimed to follow Sixth Creek from its source to its confluence with the Torrens at Castambul. We started again at the Cherryville Hall. Many of this group of walkers were not able to attend the Fruit Loop walk and experienced first hand the beauty of Fernhurst Road – in its spring show. The magnolia in full flower stiopped us in our tracks. We continued through to Bungaytown where Colin Bungay generously (and without prior warning) shared with us information about his families history in the valley and the challenges his orchardist family has faced. Refer also the summary of the “Fruit Loop” walk for details. It was interesting to note that as we walked towards Montacute the topography changed from steep valleys to a more open landscape. However disappointingly the condition of the creek significantly deteriorated with massive infestation of bamboo, blackberry and willow. Some locals commented that earlier clean up efforts (not by the Sixth Creek Group) with lack of follow – up, had contributed this problem. This walk reminded us that there is much left to do ,and that careful planning and strategic follow up on previous effiorts is crucial. Bill Spragg and Erica Womersley hosted a terrific barbecue when we all limped into their place.